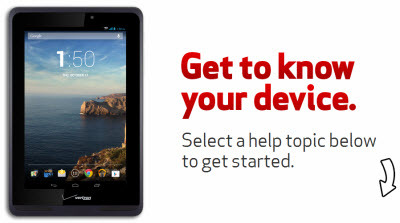 Find device-specific support and online tools for your Verizon Ellipsis 7. Learn how to activate and set up your Ellipsis 7. Discover how to add a Facebook account on your Verizon Ellipsis 7. Learn how to log out of Facebook on your Verizon Ellipsis 7. A visual walkthrough on how to update your Facebook status using your Verizon Ellipsis 7. Here's how to turn pre-installed apps on your Ellipsis 7 tablet on or off. To view recently used apps on your Verizon Ellipsis 7, view this info. Discover how to search Google Now on your Verizon Ellipsis 7. Learn how to use Google Now to automatically give you updates and information you want on your Verizon Ellipsis 7. Learn how to use voice search with Google Now on your Verizon Ellipsis 7. Learn how to add layers to Google Maps to view traffic, transit lines and more on your Verizon Ellipsis 7. Learn how to find nearby places using Google Maps on your Verizon Ellipsis 7. A visual guide on how to get voice-guided directions using Google Maps™ on your Verizon Ellipsis 7. Discover how to add a Twitter account on your Verizon Ellipsis 7. Learn how to tweet on your Verizon Ellipsis 7. Learn how to add map views using VZ NavigatorÂ® on your Verizon Ellipsis 7. Learn how to exit the VZ Navigator app on your Verizon Ellipsis 7. Discover how get directions to a location using VZ Navigator on your Verizon Ellipsis 7. Learn how to search locally using VZ Navigator on your Verizon Ellipsis 7.